With years of experience in the restoration industry, 911 Water Damage has accumulated a portfolio of satisfied customers eager to share their positive experience with you. This is our customers opportunity to evaluate how we have taken care of them and the job during the restoration process and validates that we have accomplished our task at hand. "We appreciate the fact that your work done in such a professional manner, and that you finished the work fast. I thank you for helping us our during such a drastic time for us!" "I feel absolutely confident in referring your company to others! I have already given your name and phone number to our friends and family. Your technicians were a pleasure to deal with during this frustrating experience. They were extremely patient, kind, helpful and reassuring during the assessment and while doing the work. The job was done professionally, neat and efficient all the way through to completion. They answered any questions we had and was always courteous". "We found this company to be very efficient, professional and gave excellent service. For my husband and I it was a worry free experience. 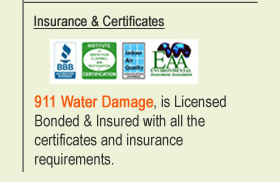 We recommend 911 Water Damage to anyone who has any type of restoration damage. They are completely reliable company." "While on vacation this Summer, a pipe burst and flooded our home. Our neighbor discovered it and they immediately called 911 Water Damage and they promptly came out that day and worked to extract the water and began the drying process. The professional manner in which the team handled themselves relieved our concerns and eased our stress level. We can't say enough about how much we appreciated their quick response and how concerned they were with our home and property. We feel their quick action prevented further costly damage. We hope not to need them again, but would recommend them, and already have, to anyone who needs their services." 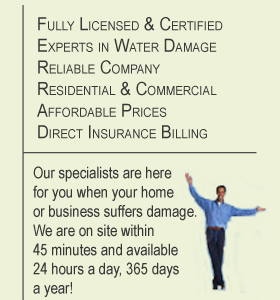 "I have never worked with a company that cares as much about customer satisfaction as 911 Water Damage does. They turned an unbelievably stressful situation completely around. Knowing they were on the job gave me complete peace of mind that the job would be done right. They are the absolute best!"